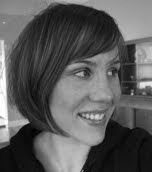 Jessica Johnson is a 2009 Oregon Literary Fellowship recipient for the Womens Writers Fellowship. Her poems and reviews have appeared in The New Republic, Prairie Schooner, the Paris Review, Burnside Review, Subtropics, Kenyon Review Online and elsewhere. Her work can also be seen on Verse Daily. She lives in Portland. A book of poems and an essay or two. start before 7:00 a.m., it’s probably not going to happen. Aquariums; overheard phrases; outdated textbooks; hatcheries;mid-century Italian films; industrial artifacts; swimming; museums; stuff that washes up on beaches; uncluttered white formica; botanical gardens; anatomical drawings; art installations; my friends’ poems.